Alex Phillip was sworn in as Supervisor of Elections ag. by Her Excellency The Governor General, Dame Cecile La Grenade, on May 26 ,2014. He attended the Chantimelle R.C. School , St. John's Christian Secondary School., University of Havana(Cuba) and Clark Atlanta University(USA). As a teacher for the past twenty eight years he gained additional certificates in many areas of Leadership and Management. 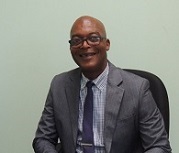 From 2003 he served in the position of Principal of Wesley College Secondary School. Mr. Phillip is humble, God-fearing, service-oriented and a lover of nature and people. In his present position, training was received from UNDP for preparation in Elections Observer Missions (EOM). He attended the 4th Biennial Conference of the Commonwealth Elections Network (CEN) where knowledge was gained about the operations of various electoral network across the world. With the Team of workers who run the Electoral System he thrives to preserve and enhance democracy by building a credible and inclusive system where everyone is respected regardless of affiliation,class, race or status.